I love the beginning of a new year. Reflecting on the last year and setting goals for the new year is so motivating and hopeful! I love it! When I set goals for the new year, I break them up based on different areas. It usually looks like this: Home, Business, Family, Self and Homeschool. 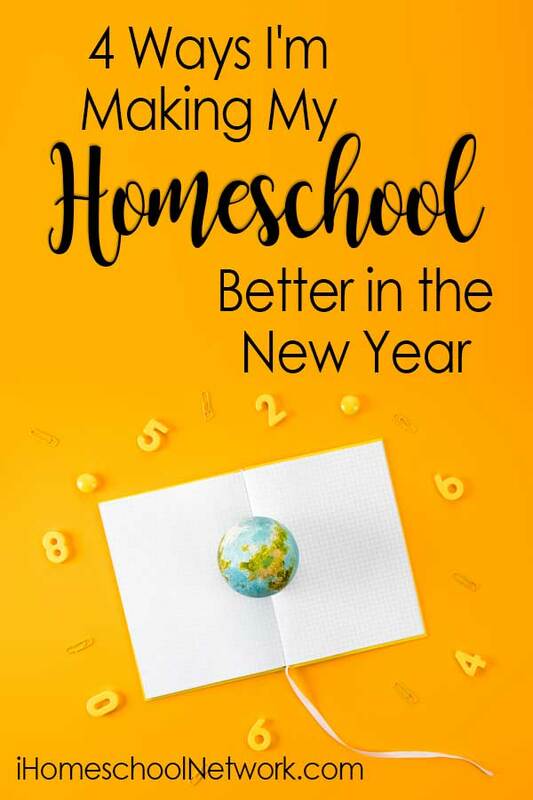 This year, as I’m setting some goals for our homeschool, I’m thinking of ways we could make our homeschool better in the new year. I took a lot of time to reflect and think about ways we got off-track in our homeschool over the last year and ways I could help keep us on the tracks. So many times, I’m the one that needs to make the adjustments first and my kids follow. Homeschooling is hard, there’s no doubt about it. But here’s a few ways we’re making our homeschool better this year. So many times, it’s up to me to make our homeschool better. That can be both overwhelming and encouraging. Overwhelming because it’s a TON of responsibility for one person! But also encouraging because that means I don’t have to wait for something or someone else to start improving things. I can begin right now! And that’s so hopeful! Working on myself: self-discipline and self-care. It doesn’t need to be a lengthy checklist to mark off each day, but even little changes can make a big difference. Homeschool moms work so darn hard. We often leave ourselves to the last thing on the list. This year, I want to work on this. And I know it will improve our homeschool. Currently my kids are 16, 13, 10, and 5. There are SO many things going on. Even though we are very careful with how much our kids are involved in, the calendar simply fills up…and fast! It’s all great stuff on the calendar, and life with four kids is going to be busy, no matter what. But I feel that by choosing to pick a few days a month and leave them totally blank, I can make sure we have a few days a month that are “down days,” which we SO desperately need in our month! Life can get so busy that homeschool gets cut short every single day in a given week. That causes things to be left unfinished and make us feel flustered and behind. I like to multitask and do many things at once. But I’m realizing in our homeschool, it works so much better to focus on doing ONE thing really well and then moving on to the next thing. That might mean a writing project or a history unit or an even memorizing a set of math facts before moving on to the next math concept. Sometimes I think we have too many irons in the fire to do anything really well. So, the goal for this year is to have a focus for the week or the month. We’ll still have our regular daily work, but aside from that, we’ll have one thing that we’re focusing on until it’s finished and finished well! My biggest goal as homeschool mama is to help shape my kids into independent, thriving, happy adults. Many times, I stay more hands-off with my kids’ day so they can learn to be more independent. BUT I’ve been noticing some things slipping–like skipped math problems, missing lessons, etc. And I think it could be improved if I micromanaged a bit more. Correct math lessons right away to catch any errors or issues my kids might be having. Follow up on assignments and make sure they’re getting finished. Follow through with projects we begin. We’ve been homeschooling for 11 years now. And I know that every year is different and every year requires a new assessment and new goals. Going with the flow and the needs of my kids has kept our homeschool going for this long. I’m excited to start implementing these goals and watch where our homeschool goes this year! What are your goals for your homeschool this year? Alicia Hutchinson is homeschool mama to four kids. You can find her blogging at learningwellcommunity.com where she shares simple solutions and easy routines to help you homeschool with confidence. Follow along on Instagram (@learningwell) where a new homeschool mom is featured each week to show you a day in their life.